Research and publication of findings are getting more complex as knowledge continues to grow. Collaborations are proving increasingly useful to tackle research questions in a more impactful way. Scientific journals want to publish more complete stories rather than smaller bits of information. Collaborations can be done outside an academic unit, an institution or a country, as research does not have boundaries. However, it is our duty to foster collaboration within our unit to bring together a critical mass of expertise in a certain domain to tackle more complex and more impactful research questions and hypothesis. Moreover, research collaboration allows graduate students and young faculty members to integrate in a team with a diversity of views and experience. It brings a dynamism that should engage our younger colleagues as they join our Faculty. All these reasons require us to take time to identify our strong domains and make sure that internal communications about our research is optimal to foster greater and external collaborations. 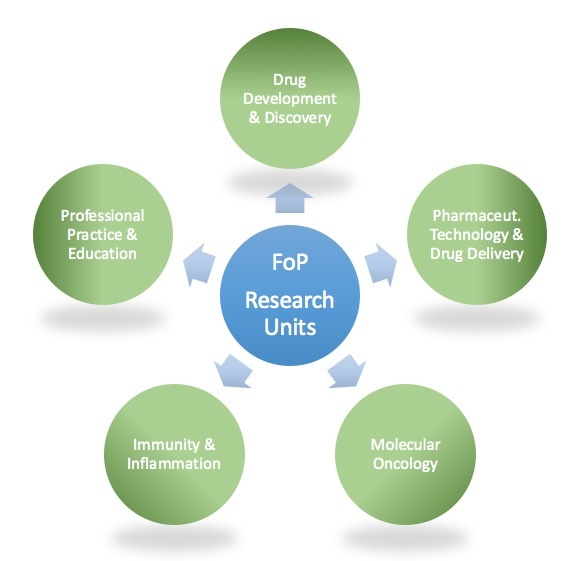 Five research units with major research focus areas, collaboration’s areas and members of the research groups with representative publications were suggested. A diagram showing the proposed research units is presented.